At least 7 police officers have been injured after Baltimore protests over Freddie Gray’s death turned violent on April 27. One of the officers is unresponsive. Live video from helicopters shows dozens of people in the streets, confronting officers and smashing at least one police car. Capt. Eric Kowalczyk said police are attempting to take control of the situation and will deploy tear gas and “pepper balls”. Baltimore protests have taken place since the death of Freddie Gray on April 19. Freddie Gray, 25, died after an encounter with police a week earlier during which he sustained serious and unexplained spinal injuries. The protests and clashes come just hours after Freddie Gray’s funeral. 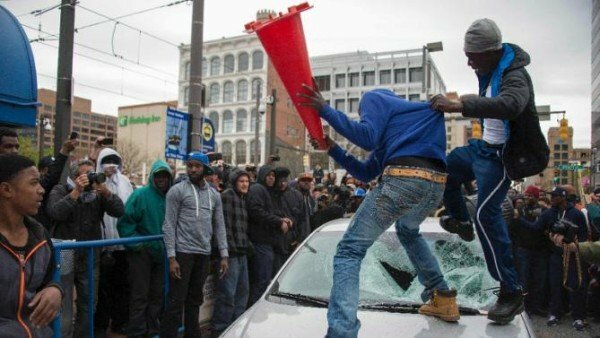 Baltimore Police have said that juveniles are taking part in the protests, and are calling on parents to find their children and return them home. The violence “does not reflect the spirit of this movement,” said Pastor Jamal Bryant, an organizer of protests in previous days. Pastor Jamal Bryant said members of his church are going in to the area to make appeals to the protestors to go home. “These are not protestors these are lawless individuals,” Capt. Eric Kowalczyk told CNN. Video feeds showed looters ransacking a neighborhood market, and, in a separate incident, burning a law enforcement vehicle. Separately, protestors destroyed a police car by jumping on it and smashing the windows. Officials said the protestors threw bricks, rocks and other items at police officers. Earlier today, a statement released by police said that its Criminal Intelligence Unit learned “that members of various gangs including the Black Guerrilla Family, Bloods, and Crips have entered into a partnership” to target officers. The violence is an escalation of earlier protests over the weekend that turned violent.